UNCANNY explores 3D virtual environments where the dialectic relation between the viewer and the image creates immersive experiences that oscillate between real and virtual space. As Lev Manovich states, “the visual language in our modern period is characterized by the existence of another virtual space, another three-dimensional world enclosed by a frame and situated inside our normal space”. Through the work of five artistic approaches involving worlds of futuristic fiction, UNCANNY progressively takes us from the idea of visual environments to the physical sensorial experience of them – in Manovich’s words, from the screen to screenless. Alfredo Salazar-Caro’s “Triptych AKA Miami Booty Bass” is a study of classic portraiture translated with 21st century tools. It re-examines the masterpiece Sagrada Familia con ángel músico, Santa Catalina de Alejandría, Santa Bárbara, (1510–1520) from the anonymous painter simply known as Master of Frankfurt. Using 3D modeling software and motion capture to portray iconographic forms of churches and drones, “Miami Booty Bass” adds a new footnote to a millennium-old conversation. “Alien ship” by Giselle Zatonyl invites the viewer to navigate a futuristic fantasy; a 3D virtual space with clear references from videogames and science fiction. Experimenting with digital textures and volume, Zatonyl creates an uncanny environment where a digital sculptural entity, a luxury machine, looms over organic forms merging into water. In ¨RandomAccessData¨, Eva Papamargariti creates a dialectical narration between visual and verbal references that explores the role of search engines and tagging in cyberspace. Streams of data and information coalesce into a tag cloud made up of random thoughts about post-internet art, radical utopian groups of the ’60s, and today’s virtual reality tools. A surreal territory unfolds as a voiceover makes uncanny references about concepts like distribution and reproduction of images, data flow, immersive experiences and the Internet, real identities versus digital identities in cyberspace. Leo Castaneda explores physical experiences of virtual reality. “Item 93201” is a multilayered piece that merges the virtual with the real. A large futuristic sculptural piece inhabits the gallery and functions as a bridge between the virtual and real space. Through a VR headset embedded in the sculpture the viewer can enter an augmented reality environment, a setting conflicted between luxury and oddity. As the viewer navigates this space he encounters elements of the physical in the virtual, objects like the sculpture itself and a painting that also hangs in the gallery. Now the virtual and the actual unfold in an intertwined dialogue, which space is actually mirroring the other? “81 Points of View (Autoplay)” by Sebastian Schmieg is media-archaeological sculpture that proposes a setup which overlaps perceived with virtual reality. Utilizing old and obsolete technology, it is disconnected from the common notion of technological progress. 81 Points of View (Autoplay) operates in between modern devices that implement augmented reality, and optical machines invented centuries ago. Where as media technology becomes smaller and eventually invisible, the piece turns that development up-side-down: due to its transparent setup, the sculpture‘s mode of operation turns out to be the actual subject matter. Schmieg combined modern devices that create augmented realities with antiquated ones that create more basic optical illusions, drawing a line through centuries of experimentation with mediated reality. As part of the exhibition programming for UNCANNY, Alfredo Salazar-Caro will be teaching a workshop at REVERSE, Intro to VR and Video Games, on Saturday, September 26th & Sunday, September 27th. Alfredo Salazar-Caro (b. Mexico, 1989) is a multimedia artist, currently based in Chicago. He works with sculpture and digital media including video, animated gifs, and virtual reality. Through these mediums Alfredo explores phenomenology, identity, memory, and time. Of these concepts, time and memory have become most central to his artistic practice, manifesting themselves as digital avatars and virtual reconstructions of environment. Alfredo Salazar-Caro has exhibited nationally and internationally in cities such as Dallas, Chicago, New York, Toronto, Amsterdam, London, Berlin, and in his hometown Mexico City. Giselle Zatonyl (b. Argentina, 1986) is a Brooklyn based multidisciplinary artist and curator. Her work explores new technologies to create immersive digital environments with video and sculpture. Zatonyl received a BFA in Photography and Art History from New World School of Arts in Miami, FL. In 2014 she was awarded a residency at Culture Hub to continue her research on systems, mechanisms, and interaction at the intersection science, technology, and art. She has exhibited her work internationally, most recently appearing in venues such as the Oude Kerk (Amsterdam) MDC Museum of Art + Design (Miami, FL), White Zinfidel (Brazil), ŠKVER (Croatia), and little berlin (Philadelphia, PA). Eva Papamargariti (b. Greece, 1987) is an architect and digital artist, currently based in London. Her projects focus on time-based media, digital installations, video and gif animations. She is interested in the creation of 2D/3D digital spaces, forms and geometries which can provoke different concepts, narrations and atmospheres each time, using a variety of methods, tools and programs. She has exhibited group and individual projects in cities like Athens, New York, Seattle, Paris, London, Berlin, Amsterdam, Lima, Toronto, Vancouver, Edinburgh, Dublin, Antwerp and also on the Internet at Panther Modern, ANIGIF, 15Folds, Channel Normal, The Wrong – New Digital Art Biennale, Eternal Internet Brotherhood, Cloaque.org, #0000FF Gallery and Decenter. Leo Castaneda (b. Colombia,1988) is an artist based in Miami and New York working in the intersection of painting and virtual reality. He also works with drawing, interactive sculpture, and animation to analyze and deconstruct the structures of video-games, and how these structures relate to those of Art and the world at large. Castaneda received his BFA from Cooper Union and his MFA from Hunter College. In 2014 Castaneda received a scholarship from the Cisneros Foundation to attend SOMA Summer in Mexico City. Sebastian Schmieg (b. Germany,1983) is a Berlin-based artist who works with found materials and custom software to create pieces that examine the way modern technologies shape online and offline realities. Schmieg continuously questions the notion of a linear technological progress in artworks that range from books to algorithmic videos. His work has been exhibited at Bitforms Gallery, New York, USA; Transmediale, Berlin, Germany; and Impakt Festival, Utrecht, The Netherlands. 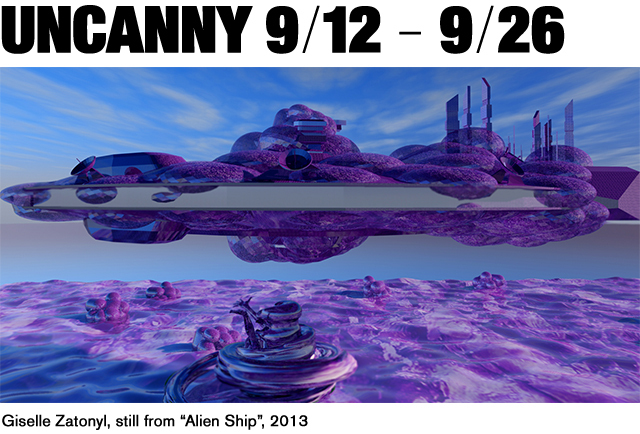 UNCANNY will open on Saturday, September 12th from 7 - 9pm at REVERSE. The exhibition will be on view until September 26th. Gallery hours: Wednesday - Saturday, 1 - 7pm and by appointment.